Sainted Evthymii, in Baptism Ioann (John), was born at the fervent prayers of the presbyter Mikhei and his spouse Anna. For long years they had been childless, and they gave a vow: if a son were born, they would dedicate him to God. The reading of priestly books and frequent visits to Divine-services, which the boy served at with his father – a priest at a not-large temple named for Saint Theodore, – all this gave sanctity to the soul of young Ioann. And at the age of fifteen, in the year 1411, he departed his parental home for a monastery. Twelve versts from Novgorod, in a wilderness spot named Vyazhisch, amidst the forests and the swamps there had settled three monks – Evphrosyn, Ignatii and Galaktion. There soon joined them the priest Pimen, who accepted tonsure with the name Pakhomii. Here they asceticised in complete solitude at a wooden chapel built by them in the name of Christ's Saint Nicholas, living in unceasing prayer and in the harsh struggle with the severe conditions of nature in the Northern regions. The young Ioann in seeking salvation came also to these ascetics. The hegumen Pakhomii accepted him fondly and tonsured him into monasticism with the name Evthymii. Tonsure at so early an age reflects the outstanding spiritual traits of the young ascetic, which were evident to the perspicacious Pakhomii. During this period in time the Novgorod archbishop's cathedra-seat was occupied by archbishop Simeon, a simple monk elevated to archbishop. The virtuous life of the Monk Evthymii became known to the archbishop. Saint Evthymii was summoned to Novgorod and after a long talk with the vladyka he was appointed the archbishop's steward. During these times Novgorod archbishops occupied quite unique a position: independent of princely authority, they were elected directly by the veche-assembly and they assumed a large role in secular matters; moreover, it imposed upon them the administration of vast land-holdings. And an archbishop's steward under these conditions had to combine administrative talent with the utmost non-covetousness and deep Christian humility. Saint Evthymii fervently entreated the archpastor to send him away back again to Vyazhisch, but then he yielded. In his new duty, Saint Evthymii evoked general astonishment and esteem, in that while occupying so important a position, and being at the centre of business life in a large crowded city, he as a monk asceticised as fervently as he would have in the deep forest. In 1421 archbishop Simeon died. Under the new hierarch, Evthymii I, Saint Evthymii again withdrew to his monastery. Soon however the monks of a monastery on Lisich Hill chose the saint as their hegumen. With the death of the Novgorod archbishop Evthymii I in 1429, the hegumen Saint Evthymii was then chosen archbishop of his native city, and on 29 November he entered into the temple of Saint Sophia. For four years the saint administered the Novgorod diocese, whilst putting off being acclaimed archbishop, and it was only on 24 May 1434 that he was consecrated at Smolensk. The archepiscopal laying on of hands was headed by metropolitan Gerasim. Saint Evthymii wisely governed his diocese over the course of 29 years, zealous in the fulfilling of his archpastoral duty. Saint Evthymii toiled much at the construction and restoration of churches, especially after the devastating conflagrations of the years 1431 and 1442. The Sophia cathedral was richly embellished by the saint, and in the Novgorod Kremlin there was built several new churches. "If thou dost wish to see, – writes Pakhomii the Logothete, – some few from the number of his great works, go to the temple of Saint Sophia. There thou wilt catch glimpse the temples of saints built by him, standing like hillocks. Not by the voice, but in the deed do they bespeak their varied charm. This was bestowed me by archbishop Evthymii, – proclaims the one church; while another sayeth – so magnificently hath he adorned me; and yet a third one doth relate – he did build me up from the very foundations. The temple of great John Chrysostom, tall and beautiful, with the hand of a Chrysostomos he blesses and from its face is proclaimed: "In as thou hast erected me a temple-habitation, I in turn shalt beseech the Creator to prepare thee habitation in Heaven". The cathedral temple of the Wisdom of God, Saint Sophia, answering from over the years in its restoration by him, proclaimeth: "He hath returned me to mine original grandeur, he hath adorned me with holy icons, he – is my praise and beauty". Saint Evthymii built also a church in honour of his Guardian Angel [i.e. Russian idiom for "patron saint"], and in 1438 he built at Vyazhitsk monastery a stone church in honour of Saint Nicholas; and in the following year – a stone church in honour of Saint John the Theologian with a refectory and consistory. Zealous for the Glory of God, Saint Evthymii concerned himself over the increase of spiritual books. From this period is found quite many a Divine-service book, transcribed "under authority of archbishop Vladyka Evthymii". Despite his abundant works, the saint always promptly fulfilled the monastic rule: whatever he did not succeed doing by day he accomplished by night. An hour before Matins the saint rose up for cell prayer. Often the whole night he spent without sleep; he wore chains, but no one knew about them until his end. The first week of Great Lent the saint spent at Vyazhitsk monastery in silent prayer, eating nothing. In 1446 the great-princely throne was usurped by Shemyaka, who entered into relations with Novgorod. The political situation in Novgorod was often quite strained. Sainted Jona (Comm. 31 March) in a special missive in 1451 urged the Novgorod people to cease their rowdiness and to heed their archpastor – "be ye in everything heedful to our son and brother, your father and teacher, the God-beloved archbishop Evthymii". Saint Evthymii, quite up in age, was troubled in soul that the actions of Shemyaka might cast a pall over his relations with the church primate he so deeply revered, and he dispatched a letter to Saint Jona. Sensing the nearness of his death, Saint Evthymii besought for himself prayers and pardon. Saint Jona in the reply letter – a grammota of pardon, wrote: "We call to mind for thee, my son, that thou didst comport thyself too simply: one, who was excommunicated for transgressions by our humility, ye did accept unto yourself and find worthy of your blessing. And do thou, my son, offer repentance in this before God". And with this Saint Jona gave orders: if the grammota of pardon should arrive after the blessed end of the Novgorod archpastor, then it should be read over his grave. Sainted Evthymii reposed on 10 March 1458. 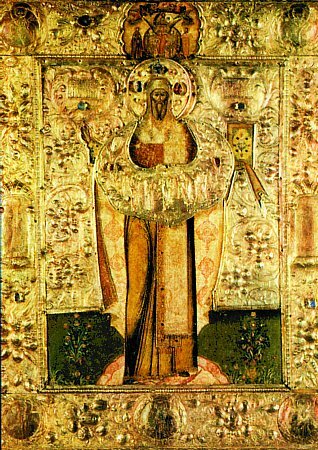 The priest Evmenii, dispatched by Saint Jona with the grammota of pardon, arrived in Novgorod 16 days after the death of Saint Evthymii, whose grave at his bequest stood at the church of the Vyazhitsk monastery. When they opened the grave so as to read the grammota of pardon, they then saw that no decay had touched the body of the saint. Saint Evthymii lay there as though asleep, and his fingers were positioned in blessing. "God preserve yet Novgorod, for which Sainted Evthymii doth pray", – loudly exclaimed Evmenii, and reading the grammota of Saint Jona, he placed it into the hand of the deceased hierarch. Soon after the death of the saint, the Lord glorified him in blessing with grace those, who recoursed to his prayerful intercession. Highly revering the saint, the monks of the Vyazhitsk monastery in gratitude erected a church in honour of Saint Evthymii, which was noted in the census of 1500. The celebration of the memory of Saint Evthymii was established at the Moscow Sobor of 1549. The Vita (Life) of Saint Evthymii was written by Pakhomii the Logothete, having been commissioned by Saint Jona, Archbishop of Novgorod (+ 1470, Comm. 5 November).